Rep. Donna Oberlander was named the Pennsylvania Rural Educator of the Year and received the Hillman Award for her contributions to rural education. She is pictured with Arnold Hillman, for whom the award is named. 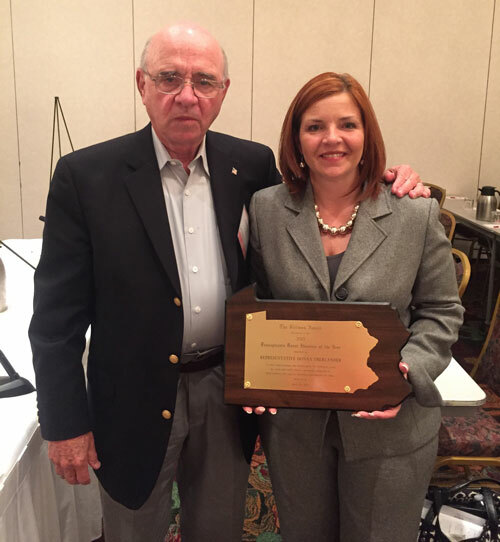 HARRISBURG – To recognize her work to advocate for rural and small schools in Pennsylvania, Rep. Donna Oberlander (R-Clarion/Armstrong/Forest) has received the Hillman Award and been named the “Pennsylvania Rural Educator of the Year” from the Pennsylvania Association of Rural and Small Schools (PARSS). Oberlander was specifically cited for her contributions to improving education and opporunities for rural students, according to Executive Director Joseph Bard. The award was given to Oberlander at the association’s annual conference April 23 in State College. As part of the award, a $2,000 scholarship in the name of Carol Hillman is given to a student in one of her school districts. This year’s recipient is Addison Hockins, a senior at Clarion Area High School, who received his award at last week’s banquet. For more than 30 years, the Pennsylvania Association of Rural and Small Schools has advocated for the interest of rural and small schools across the Commonwealth.